Take a lawyer or politician to lunch…. 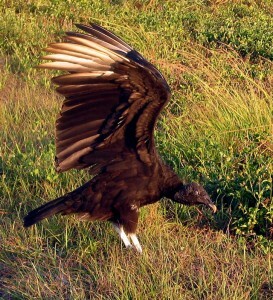 That got me to thinking about how many vultures I’ve seen on or around the Lake Okeechobee Scenic Trail (LOST). The single ones playing around in the thermals never worried me much. They provide an interesting diversion while I’m cranking along. I AM a little more concerned I pass ones like this. I don’t like the way they’re eying me. Matt and I weren’t too worried about these guys we encountered on our cross-Florida ride. They were full from polishing off a dead deer on the side of the road. This isn’t a joke. There’s actually a web site promoting it. It started out in England and South Africa and has now gone international. Check out some of the world-wide events planned for the day. Vultures aren’t cute and cuddly like some of the other birds I see from bikeback, but just think where we’d be without nature’s garbage collectors. Somebody has to clean up all those slow-moving armadillos, possums and other roadkill. So, the next time you see a vulture on the side of the road, give him a nod of thanks. And keep moving. They eat dead stuff. Tim O’Meilia was a general assignment reporter at The Palm Beach Post. 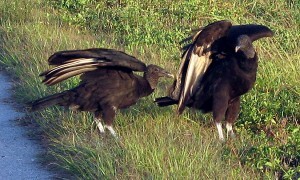 Every year, the vultures would arrive in Palm Beach County for The Season. 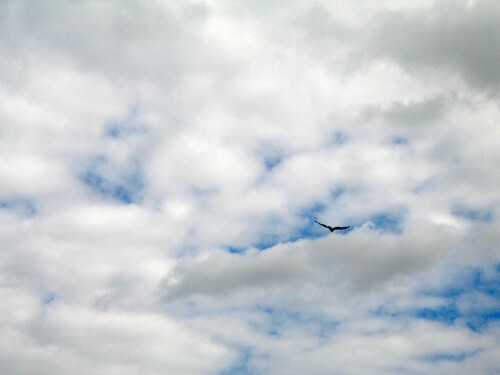 We locals were used to it, so we weren’t concerned when the skies over us were covered with circling carrion crunchers. Snowbirds and tourists weren’t quite so sanguine. They would be concerned that Bernie Madoff or someone like him had come to pick their bones clean literally as well as financially. Eventually, some editor would pull his eye off the gazillion TV sets hanging from the ceiling and actually look out the window at the Real World. That’s when you’d hear, “TIM!! !” on the editor bellowcom. See, Tim was the poor guy who had to write The Vulture Story each and every year that I can remember. To his credit, he managed to find a fresh peg every story. We old-timers would have understood if he had put his old stuff on a five-year cycle, but, no, it was always something new. Fortunately for both the editors and the vultures, Tim was one of The Post 300 who left the newspaper a year ago. I wonder who’ll get drafted for The Vulture Story this year. With the state of newspapers these days, the circling vultures may actually know something. Unfortunately for them, they’ll find the corpse has been pretty much picked clean already. The vultures are massing over the carcasses of thousands of dying small business and small- cap public companies these days too. Hedge and VC funds have shifted their business model to bone-picking from equity investing. Maybe we should have an International Vulture Capitalist Day. Thanks for the mention. I’m glad to know that vultures make you think of me. A natural connection. International Vulture Appreciation Day on Sept. 5 notwithstanding, the turkey vultures usually wait until mid-October to visit South Florida. They are early season, uh, snowbirds. “The buzzards are circling near Donald Trump’s Palm Beach estate, but none of them is a tabloid reporter or a loan collector. 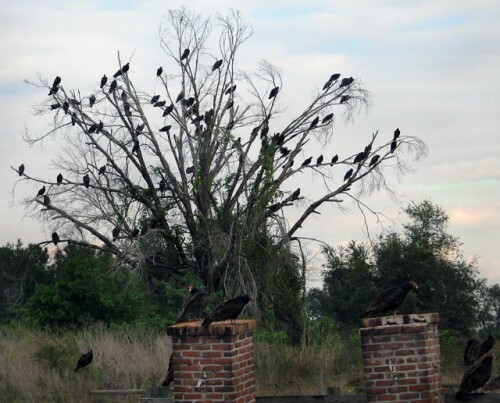 These are genuine turkey vultures, come to roost annually in the Australian pines in the island bird sanctuary across Southern Boulevard from Trump’s Mar-a-Lago and keep an eye on holiday trick-or-treaters. Anytime you can get Trump and turkey vultures in the same lede, it’s golden. “Biologists consider them part of Mother Nature’s recycling program. Ah, I miss the good ol’ days of puking vultures, lovelorn gators (Q: Why did the gator cross the road? A: He was looking for love in all the wet places) and mating-to-the-death lovebugs. I enjoy your blog. Stay with it. I’ve always admired a journeyman journalist who could take the same story and come up with something new year after year. When I was paper-hopping, I can always remember how the first assignment at the new job was exciting. Then you’d hit your first anniversary and that damned assignment was back again. By the time I saw it coming around for the third time, I knew it was time to start sending out resumes. How you kept it fresh every year amazed me.